Horse chestnut was shown to be effective for treating chronic venous insufficiency but its long-term effects are not known. Horse chestnut is a seed extract. One of its active components is aescin, which may reduce inflammation and increase the tone of veins. It also reduces the release of enzymes, which is typically increased in chronic diseases of the vein. Other compounds in horse chestnut generally increase the tone of blood vessels and decrease their permeability. Horse chestnut extract was shown in some studies to be effective against chronic venous insufficiency. A compound called aesculetin may act as an anticoagulant and blood thinner, and is therefore often excluded from over-the-counter horse chestnut products. Several clinical trials support use of horse chestnut as a short-term treatment for CVI, but its long-term effects are unknown. There is no scientific evidence to back this claim. There are no data to support this. This claim is not backed by any evidence. 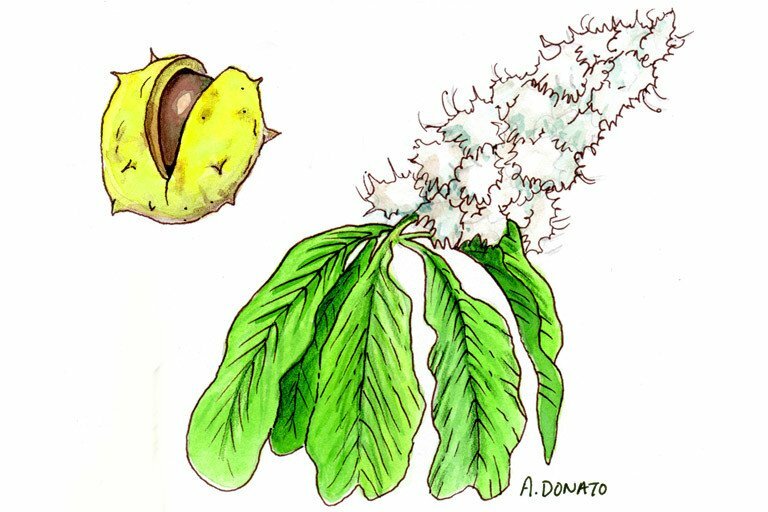 Horse chestnut seed is classified by the FDA as an unsafe herb. Many of the compounds in horse chestnut are considered to be toxic. You are taking drugs that are substrates of Cytochrome P450 enzymes: (Horse chestnut may increase the side effects, and may also reduce the effectiveness of such drugs). Chestnut poisoning: Diarrhea, muscle twitching, dilated pupils, depression, and paralysis can occur after high doses of horse chestnut. Chestnut bezoar (well-defined, ovoid-shaped mass) causing intestinal obstruction and abdominal pain was reported in a 68-year-old woman following consumption of excessive amounts of horse chestnut for several months. The bezoar was removed by surgery. Life-threatening kidney rupture was observed in a patient with angiomyolipoma (AML), a benign fat-containing tumor of the kidney, after taking horse chestnut seed extract for venous insufficiency. Her symptoms improved after an emergency embolization. Horse chestnut, a tree native to the Balkan Peninsula, has been used in traditional medicine for centuries. The seed extract is a popular dietary supplement used to support vascular functions. Horse chestnut should not be confused with sweet chestnut. Escin, also known as Aescin, a natural mixture of triterpenoid saponins isolated from the seed of the horse chestnut and the major active principle, was shown to have anti-inflammatory (1), neuroprotective (1), antitumor effects (2) (3), and enhances the efficacy of gemcitabine (18). Data from clinical trials suggest efficacy of horse chestnut seed extract against chronic venous insufficiency (CVI) (4) (5). Conclusions from systematic reviews and meta analysis state that horse chestnut extract is a safe and well tolerated treatment for CVI (6) (7) (8). Escin may also be effective in improving sperm quality in patients with varicocele-associated infertility (14). Patients with compromised renal or hepatic function should not consume horse chestnut products. Escin, also known as Aescin, a natural mixture of triterpenoid saponins isolated from the seed of the horse chestnut has been identified as the active principle. The anti-inflammatory effects of escin involve significant downregulation of expression of certain inflammatory genes, and upregulation of expression of granulocyte-macrophage colony-stimulating factor (GM-CSF), which also confers neuroprotection (1). One of the mechanisms by which escin reduces chronic venous insufficiency is thought to be via inhibition of elastase and hyaluronidase, both involved in enzymatic proteoglycan degradation, which constitutes part of the capillary endothelium and is also the main component of the extravascular matrix (19). The contraction of veins and arteries by horse chestnut is believed, partially, to be mediated through 5-HT(2A) receptors; horse chestnut also reduced platelet aggregation in vitro (20). Beta-aescin and 5-fluorouracil were reported to inhibit human hepatocellular carcinoma SMMC-7721 cells, which may be due to the synergistic effects including cell-cycle arrest, induction of apoptosis, activation of caspases-3, 8 and 9, and down-regulation of Bcl-2 expression (17). In another study, escin was shown to potentiate the efficacy of gemcitabine, partially due to the inhibition of the nuclear transcription factor (NF-κB) activity and consequent inhibition of c-Myc, COX-2, Cyclin D1, Survivin, Bcl-2 and Bcl-xL, and the activation of caspase-3 (18). Horse chestnut seeds are classified by the FDA as unsafe because of their toxic effects which include depression, muscular incoordination, paralysis, coma, and death (21). Case Report: Chestnut bezoar (well-defined, ovoid-shaped, intraluminal mass with mottled gas pattern) causing intestinal obstruction and abdominal pain was reported in a 68-year-old woman following consumption of excessive amounts of horse chestnut for several months. The bezoar was removed by surgery (15). Case Report: Life-threatening kidney rupture was reported in a patient with angiomyolipoma (AML), a benign fat-containing mesenchymal tumor of the kidney, after taking horse chestnut seed extract for venous insufficiency. Her symptoms improved after an emergency embolization (16). Anticoagulants / Antiplatelet agents: Horse chestnut may have an additive anticoagulant effect due to aesculin, a hydroxycoumarin (14). Cytochrome P450 substrates: Aescin was shown to both inhibit and induce CYP1A2, CYP2C9 and CYP3A4 enzymes in a study of rats, and can affect the intracellular concentration of drugs metabolized by these enzymes (22). Zhou XY, Fu FH, Li Z, et al. Escin, a natural mixture of triterpene saponins, exhibits antitumor activity against hepatocellular carcinoma. Planta Med. 2009 Dec;75(15):1580-5. Harikumar KB, Sung B, Pandey MK, et al. Escin, a pentacyclic triterpene, chemosensitizes human tumor cells through inhibition of nuclear factor-kappaB signaling pathway. Mol Pharmacol. 2010 May;77(5):818-27. Diehm C, Trampisch HJ, Lange S, Schmidt C. Comparison of leg compression stocking and oral horse-chestnut seed extract therapy in patients with chronic venous insufficiency. Lancet. 1996;347:292-4. Diehm C, Vollbrecht D, Amendt K, Comberg HU. Medical edema protection—clinical benefit in patients with chronic deep vein incompetence. A placebo controlled double blind study. Vasa. 1992;21:188-92. Siebert U, Brach M, Sroczynski G, Berla K. Efficacy, routine effectiveness, and safety of horsechestnut seed extract in the treatment of chronic venous insufficiency. A meta-analysis of randomized controlled trials and large observational studies. Int Angiol. 2002 Dec;21(4):305-15. Pittler MH, et al.Horse-chestnut seed extract for chronic venous insufficiency. A criteria-based systematic review. Arch Dermatol. 1998;134:1356-60. Pittler MH, Ernst E. Horse chestnut seed extract for chronic venous insufficiency. Cochrane Database Syst Rev. 2006 Jan 25;(1):CD003230. Review. Barnes J, Anderson LA, Phillipson JD. Herbal Medicines: A Guide for Health-Care Professionals. London: Pharmaceutical Press; 1996. Fetrow CW, Avila JR. Professional’s Handbook of Complementary and Alternative Medicines. Philadelphia: Springjouse; 1999. Brinker F. Herb Contraindications and Drug Interactions, 2nd ed. Sandy (OR): Eclectic Med. Publications; 1998. Schulz V, et al. Rational Phytotherapy: A Physician’s Guide to Herbal Medicine, 3rd ed. Berlin (Germany): Springer; 1998. Morrison D. Boehringer-Ingelheim Product Information Venastat™2001. Fang Y, Zhao L, Yan F, et al. Escin improves sperm quality in male patients with varicocele-associated infertility. Phytomedicine. 2010 Mar;17(3-4):192-6. Chen WT, Suk FM. Abdominal pain after consuming a chestnut. Diagnosis: Chestnut bezoar in the jejunum. Gastroenterology. 2011 Jun;140(7):e9-10. Ming ZJ, Hu Y, Qiu YH, Cao L, Zhang XG. Synergistic effects of beta-aescin and 5-fluorouracil in human hepatocellular carcinoma SMMC-7721 cells.Phytomedicine. 2010;17(8-9):575-80. Wang YW, Wang SJ, Zhou YN, Pan SH, Sun B. Escin augments the efficacy of gemcitabine through down-regulation of nuclear factor-κB and nuclear factor-κB-regulated gene products in pancreatic cancer both in vitro and in vivo. J Cancer Res Clin Oncol. 2012 May;138(5):785-97. Facino RM, Carini M, Stefani R, Aldini G, Saibene L. Anti-elastase and anti-hyaluronidase activities of saponins and sapogenins from Hedera helix, Aesculus hippocastanum, and Ruscus aculeatus: factors contributing to their efficacy in the treatment of venous insufficiency. Arch Pharm (Weinheim). 1995;328720-724. Felixsson E, Persson IA, Eriksson AC, Persson K. Horse chestnut extract contracts bovine vessels and affects human platelet aggregation through 5-HT(2A) receptors: an in vitro study. Phytother Res. 2010 Sep;24(9):1297-301. FDA Poisonous Plant Database. http://www.accessdata.fda.gov/scripts/plantox/detail.cfm?id=29376. Accessed February 10, 2015. Huang Y, Zheng SL, Zhu HY, Xu ZS, Xu RA. Effects of aescin on cytochrome P450 enzymes in rats. J Ethnopharmacol. 2014;151(1):583-90.